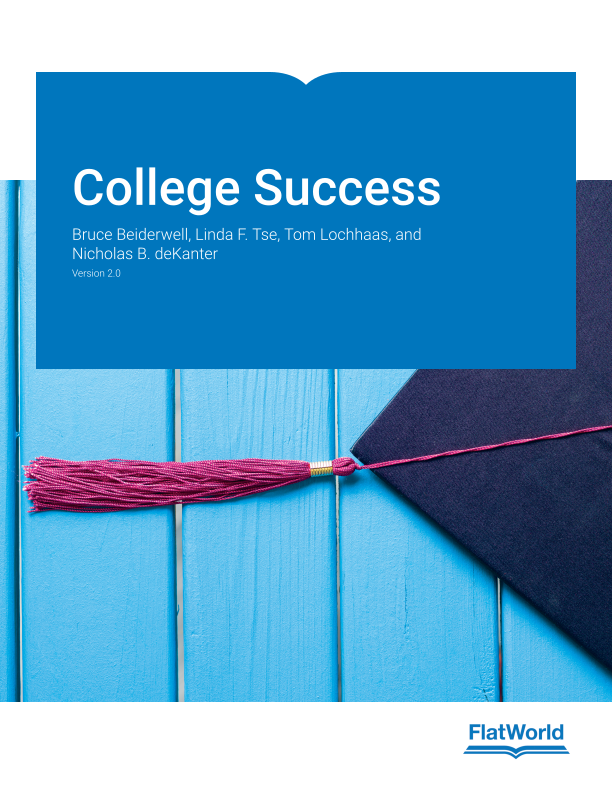 College Success is not a textbook full of theory and extensive detail that merely discusses student success; rather, this is a how-to manual for succeeding in college. This book provides realistic, practical guidance ranging from study skills to personal health, from test-taking to managing time and money. Discussion of online courses, blended or flipped courses; online instructor and student interaction. New coverage of digital exams, computer-scored tests and essays. Discussion of digital learning tools and apps in all areas: note-taking, writing, health and fitness, time management, finances and budgeting, and more. Added section on financing of college, risks of student loans, career guidance. This book is now available with FlatWorld’s Homework System at no additional cost to your students. With the new, easy-to-use Homework System, you will be able to assign questions and autograde homework. The system includes multi-format questions written specifically for your FlatWorld book, which you can access through our stand-alone interface or integrate with your learning management system (e.g. Canvas, Moodle, Brightspace/D2L, and Blackboard). Visit the FlatWorld Homework page to learn more. To schedule a demo for help in setting up FlatWorld Homework for your course, contact your Sales Rep or FlatWorld support. 1.2 Who Are You, Really? 1.5 What Is College, Really? 4.3 Are You Ready For Class? 4.4 Are You Really Listening? 5.2 Are You Ready For The Big Leagues? 5.3 How Do You Read To Learn? 7.2 Why Attend Classes At All? 8.2 What’s Different About College Writing? 8.3 How Can I Become A Better Writer? At FlatWorld, we take pride in providing a range of high-quality supplements alongside our titles, to help instructors teach effectively. Supplements are available for instructors who have registered their adoption with us. If you need to review or preview something specific, please contact us. Need assistance in supplementing your quizzes and tests? Our test item files (in Word format) contain many true/false, multiple choice, fill in the blanks, and short essay questions. The Instructor Manual (in Word format) will help guide you through the main concepts of each chapter such as learning objectives, key terms and takeaways. Many also include explanations and answers to chapter exercises. A PowerPoint presentation highlighting key learning objectives and the main concepts for each chapter are available for you to use in your classroom. You can either cut and paste sections or use the presentation as a whole. Solutions manuals, sample exams, video learning segments, workbooks, cases and lab manuals are just some of the extras our books will offer depending on the needs of the course. Click here to see what this textbook offers. We have taken our test item file and created files to import into several Learning Management Systems. Click for detailed information and file availability. Bruce Beiderwell (PHD UCLA) has served as Director of the UCLA Writing Programs since 2001. He regularly teaches developmental writing classes that serve students who arrive at the university without the preparation or skills they will need to succeed. This teaching role links him to broad efforts from across the campus, particularly the library and the College Learning Center. In this respect, he works with colleagues in English as a Second Language, Library Science, Athletics, and Counseling. In addition, Bruce’s role as a faculty mentor to student athletes in the University’s "Community of Learners" program connects directly to his work identifying, placing, and instructing at risk students. Bruce has also overseen and taught in UCLA's Transfer Intensive Program built upon the notion that the crucial part of a successful transfer is the ability to write. For his work with nontraditional students seeking admission (or re-admission) to the university through UC Extension courses he received a UCLA Teaching Award. While Bruce has spent most of his professional life as a writing teacher and administrator, his Ph.D. is in English literature and his first publications focused on nineteenth century fiction. His book, Power and Punishment in Scott's Novels was nominated for a McVities Prize. Bruce was also guest editor of a special edition of European Romantic Review that was devoted to essays on Walter Scott. In addition he is the co-author of the widely used literature anthology The Literary Experience (co-authored with Jeff Wheeler) published by Wadsworth Publishers Bruce's teaching interests along with his concern for undergraduate education have moved him outside this fairly narrow scholarly world. He has taught a wide range of literature and composition courses in the past 20 years--everything from courses on Faulkner to business writing workshops. He has been involved in administrative work (student placement, curriculum development). And he has consulted in the development of teaching materials for use in business settings. Linda F. Tse (MS Minnesota State University, Mankato) has been an educator for over two decades, first as a high school English teacher in Hong Kong and currently at Minneapolis Community & Technical College. Since 1997, Linda has been working as a counselor on college campuses, initially at four-year comprehensive universities before finding her passion working with the student body at MCTC where 43% of the students are non-Caucasian and more than 80 different languages are spoken on campus. New immigrants for whom English is a second language, first generation college students, non-traditional students, single parents, and students living below the poverty line make up the majority of the College’s student population. Born to refugee parents in Hong Kong, Linda came to the U.S. on a student visa with the help of a scholarship. Her personal struggle together with her professional training has enabled her to relate readily to under-represented and under-served students who aspire to higher education in the face of adversity and disadvantage. In this regard, she provides academic, career, and personal counseling, while teaching classes in Career Development and Life Planning, and College Success Strategies. In addition to her academic responsibilities, Linda works professionally with dislocated workers and people with disabilities. Tom Lochhaas is a teacher, a writer, an editor and a consultant. He received his MFA in writing from the University of Arizona and is ABD in English at Washington University. He is a member of Phi Beta Kappa. Tom has taught at the University of Arizona, Otterbein College, Washington University and at UCLA. His teaching focus has been on freshman course with an emphasis on reading, writing, and study and communication skills. Tom’s special interests are in working with unprepared students and recent immigrants. As a college instructor, Tom has always focused on what students actually need—not necessarily what professors might think they need—to succeed in their studies, regardless of the particular topic. In an academic world where many students do not read their textbooks at all, or have difficulty understanding them when they do, it is critical to be realistic about how today’s students learn and how best to reach them. “A weighty traditional tome might look like the best classic student success textbook to some instructors”, Tom says, “but such a text fails if students can’t or won’t read it. Students quickly become frustrated by reading materials not useful to them as students or appropriate for their needs.” His expertise in how to shape an effective textbook is part of what he brings to this authorship team As a professional college textbook editor and writer, Tom specializes in making textbooks accessible for students in many curriculum areas including communications, software and technical manuals, and public health information. In his work with public organizations such as the American Red Cross and the National Safety Council, he has brought an expertise in language and reading level to ensure a wide range of publications are appropriate for their intended audiences. He has written or ghost-written several dozen textbooks and other books. Nick deKanter (Tufts University) is an educational advocate, consultant and marketing professional. As Founder and President of the Vision 21 Education Group, he is working to support schools seeking to transform into 21st century learning environments that help students master core subjects and connect them to real world needs, think critically, communicate clearly, and practice collaboration and innovation.